If you’ve been following along, you know I am a big fan of the no knead bread recipes. 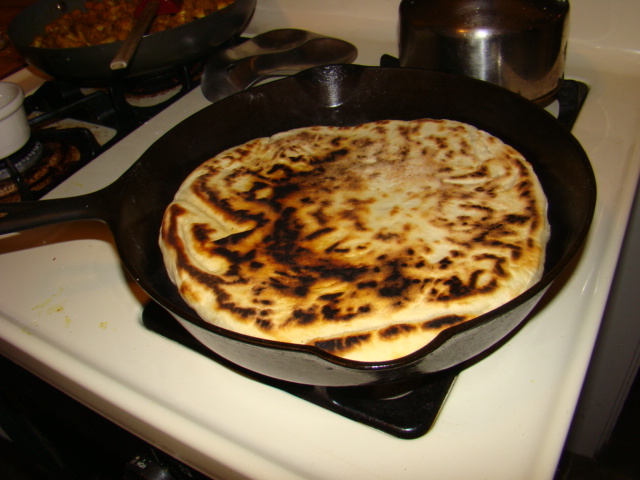 Fortunately the second one I tried also can be used for Naan, which will accompany my Meatless Monday Vegetable Curry, which utilizes the Basic Curry Sauce I made yesterday. Start with the basic bread recipe. You’ll want a large heavy skillet, and about a tablespoon of oil. 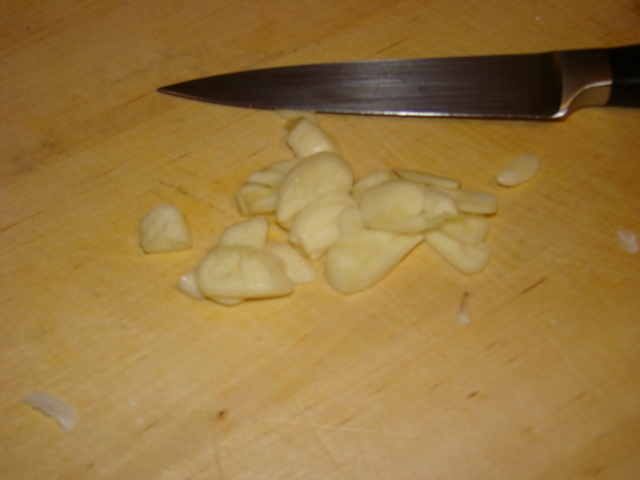 I cut up some garlic to use on it, purely optional. 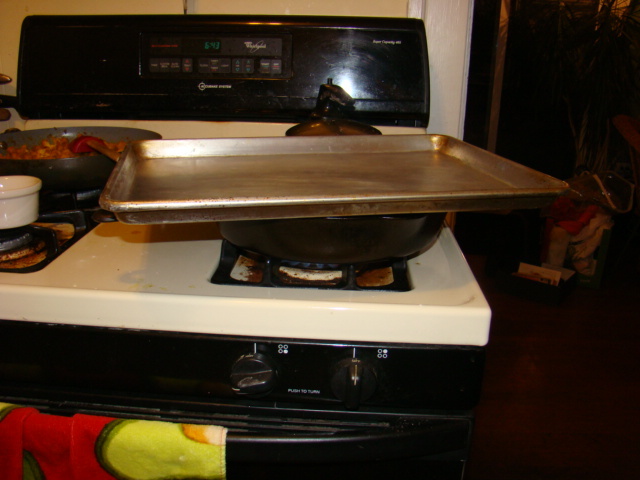 Heat the pan over high heat. Dust board with a little flour. 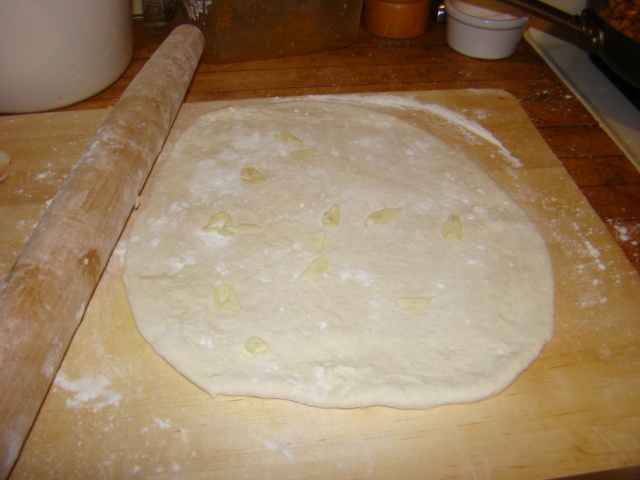 Take a peach sized piece of the premade dough, dust with a little flour and put it on the board, roll it out to about 8- 9 inches diameter and about 1/8″ thick. Use minimal flour – just enough to keep from sticking. This is where I added the garlic. When the pan is hot and drops of water skitter across the surface before they evaporate, add the oil (or ghee) coat the bottom of the pan and pour out the extra oil. I got two naan from 1 tbs oil. 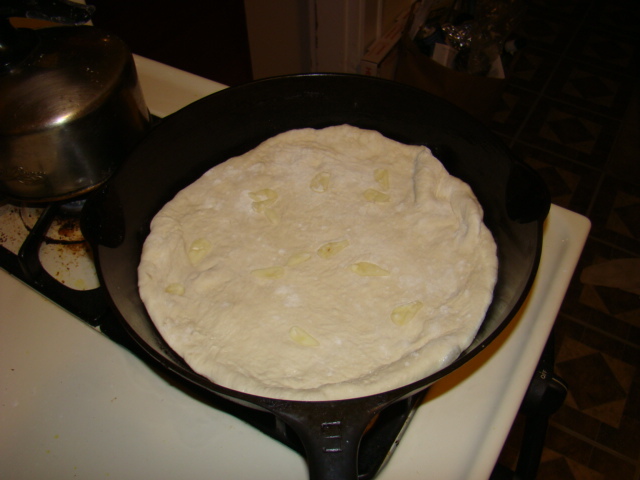 Put the dough round in the pan, reduce heat to medium.Cover to trap heat and steam. Notice my fancy cover! Check for doneness with a spatula after about 3 minutes or sooner if you smell it overcooking. That’s a nice way to say burning. It was pretty spectacular when I removed covering sheet pan! 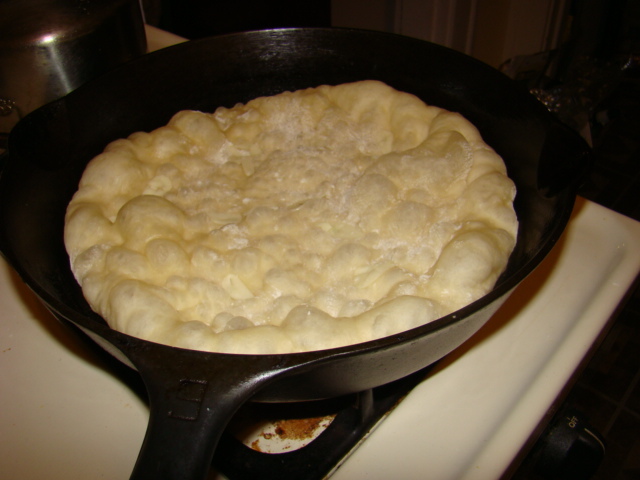 Carefully flip naan over, and cook until 2nd side is browned. Though it is a bit dark. I made another one without garlic and had better control over the heat. Sorta like pancakes – you always burn the first one or two! Give this versatile recipe a try! 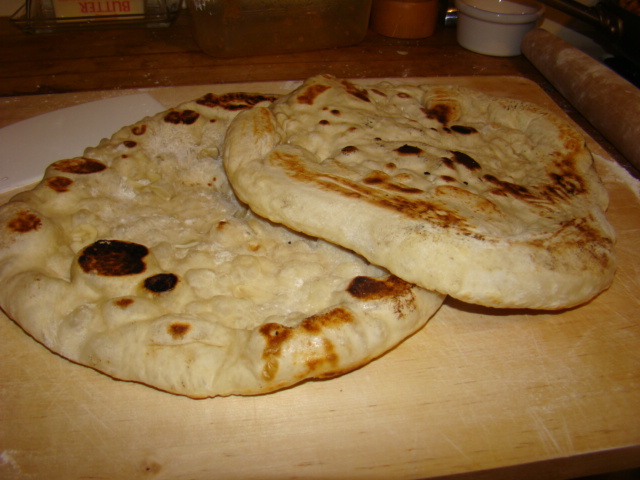 >Naan looks like an delicious Indian pizza. 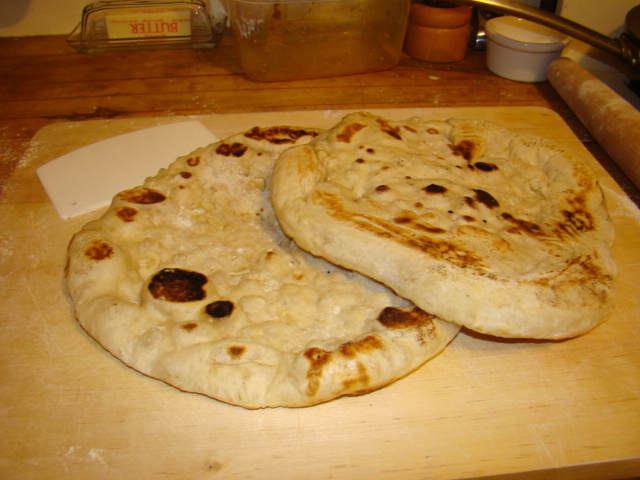 >We know from experience that it is easy to make too many naan, but we also know that they freeze well. >That's a great point Mark! Thanks! >beautiful! i make mine in a screamingly hot oven and on a pizza stone. easy peasy! >You're right Ofg! It is easy, and delicious!